Construction in Corcoran School of the Arts and Design’s flagship building has caused crowded and often unavailable workspaces, breathing problems and noise during class times, students and faculty said. Dust-covered rooms and the grind of construction equipment have become a daily nuisance for students taking classes in the Corcoran School of the Arts and Design’s flagship building. Several students and faculty said in interviews that renovations in the Flagg Building have caused crowded and often unavailable workspaces, breathing problems and incessant noise during class times. Students said the construction hinders their learning environment and has spawned health issues for some students over the course of the semester. Officials said they have heard concerns from students and faculty about conditions in the building and have hired an outside environmental testing firm to test for toxic chemicals, which has so far found that the air is safe to breathe. As part of the University’s deal to absorb the Corcoran College of Art + Design in 2014, officials committed about $80 million to renovate the school’s historic but aging headquarters on 17th Street. 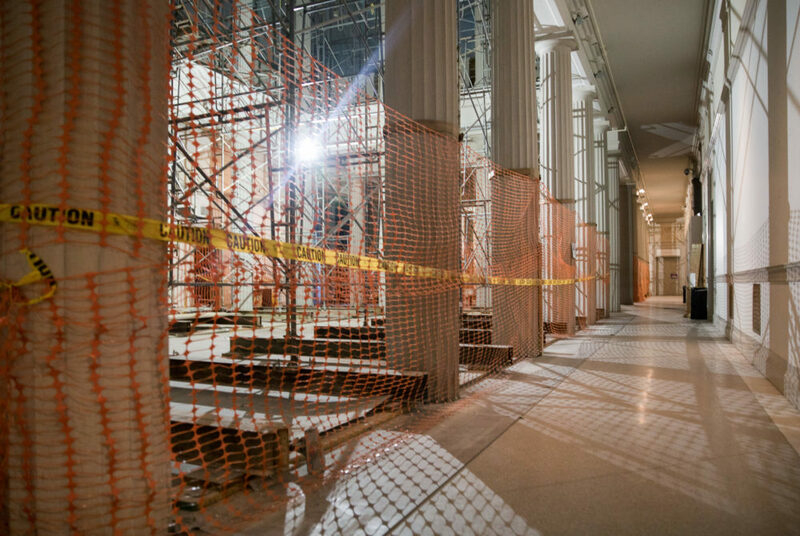 The first phase of the renovations – which began in the summer of 2016 – to overhaul the building’s mechanical infrastructure and update the second floor gallery is still ongoing. He said some students have resorted to wearing dust masks over their faces and that the ongoing work makes it difficult for students in the school to work on projects or meet with professors in the building. “It’s a huge nuisance and a huge hindrance, especially to our education, and the administration is just pretending like everything is hunky dory,” he said. About 75 class sessions are being held in classrooms and studios per week while the building remains a construction zone, officials said. The school is waiting on $32.5 million in donations to complete all phases of the planned upgrades. This semester, crews are working on upgrades to the second floor, grand stairway, rotunda and sub-basement of the building, according to a memo sent to Corcoran students and faculty in August. Crews are also building a scaffolding in the atrium. Officials hired Triumvirate Environmental, a waste management service, last spring to test the air in the building monthly for toxins like lead and asbestos. So far the tests have found no “regulatory cause for concern,” according to the memo. But officials have made dust masks available in the director’s office for students who have concerns. Contractors from Whiting Turner, the company overseeing construction, have also installed 12 air scrubbers to mitigate the amount of dust in the air, according to the memo. Sanjit Sethi, the director of Corcoran, said he had heard complaints from students about breathing problems because of contaminants in the air and that CCAS officials have sought to address complaints with administrators in the Columbian College of Arts and Sciences – which includes the Corcoran – and GW’s Office of Health & Safety. “We have heard this concern consistently from students and staff alike and actively work to address these issues and do so within the set policies and systems that exist within GW,” Sethi said in an email. On multiple visits to the Flagg Building last week, the grind of construction equipment and air filtration systems could be heard throughout the building and layers of dust had collected on nearly every flat surface. Barbara Brennan, a visiting assistant professor of exhibition design, said she didn’t have access to her office earlier in the semester because of the construction, forcing her to hold meetings with students in the noisy atrium area or in cubicles in the director’s suite. She said because there are few classrooms currently not under construction, classes occupy most rooms throughout the day and students have little time to use those spaces for their own projects. Some students said they have had issues with the air quality in the building because the dust can interfere with breathing and cause coughing fits. Ashley Burns, a student studying digital media and design, said she had trouble breathing earlier in the semester when the construction involved more intensive work. Burns said students and faculty regularly complained to administrators about construction noise disrupting classes during the spring semester, but the issues remain unaddressed. Other students taking courses in the Flagg Building said the noise from construction workers and the hum of the air filters was a big distraction from classes and made it difficult to work on projects or meet with professors. Sophomore Carolyn Shipe, a graphic design major, said the construction noises significantly impact how well students can hear and participate during class. She said students taking classes in the design studio can hear equipment being pushed up against a ramp next to the classroom nearly every five minutes. Earlier in the semester, Shipe said students had participated in a community meeting with Sethi and other officials where students talked about the problems the construction zone was creating in classrooms. “We just voiced our concerns about construction hindering classes, communication between administration and students, and security,” she said. Lauren Raffensperger, an art history major, said she didn’t mind the noise, but the construction was particularly disruptive for professors who had their offices and all of their classes in the building. Raffensperger said the construction was a temporary inconvenience that Corcoran students were learning handle. “I think most everyone is just dealing with it right now and we can’t wait for it to be done, so we’re just sucking up,” she said.